After all the October events and having a bit more time in my hands due to vacation, I started reconsidering my painting direction. Armando makes me reconsider it *every day* but that is another story :). When I get in this kind of "funk", I find it useful to go stroll in a museum or a good exhibit to stay enthusiastic and even though I have no ego problems, humble and conscious of the way ahead. I also find it helpful to enter smaller events and socialize with artists and people interested in art. 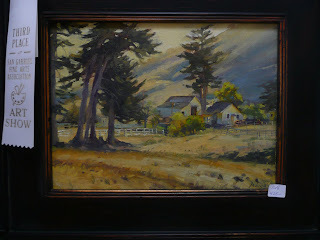 a) I visited the Laguna Plein Air 2009 event and let my jaw drop in front of the Ray Roberts, Calvin Liang, Jennifer McChristian, Greg La Rock, Ken De Waard , Bryan Scott Taylor and J. Budicin masterpieces among others. I also took a peek through the "Pasadena, City of Trees" organized by the California Art Club. 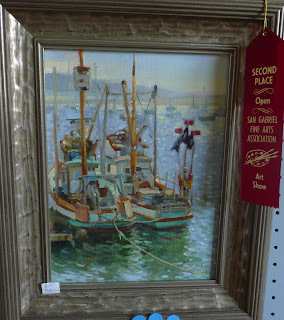 b) I entered some paintings in the San Gabriel Fine Arts Fall show -that is where I got the ribbons in the pictures- as well as the Craftsman Weekend in Pasadena where my gallery Jose Vera had a booth. I also entered the miniature show at the Segil gallery which afforded me the opportunity to talk with Jason Situ and Laura Segil for a while. 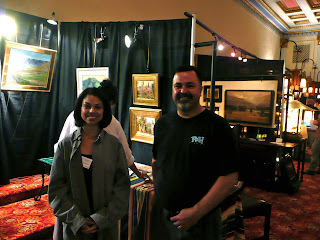 Here are Tania Verafiled and myself at the Masonic Temple in Old Pasadena during the Craftsman weekend. My paintings separate us, figuratively speaking. So many questions bubbling in my head. One is the matter of size. Painting bigger and not in just one session as I usually do. I am not a subscriber of bigger is better but it would be interesting to see a painting through in a larger scale. The other is the question of the physical studio. Part of the reason I don't tackle certain projects is a lack of appropriate space. I need to work on a solution and quickly. And of course the question of "quality". That I don't expect to ever solve.... fortunately. I think we ALL have those same questions, Jose!! You are always so busy and doing wonderful things!! The awards are well deserved... I LOVE you work. Hope all is well with you, Jose!